The Province of Viterbo, Italy in the magnificent, extends for about 3,600 square km between Rome, Tuscany, Umbria and the Tyrrhenian Sea. The population is around 315,000 inhabitants and is the capital of Viterbo with its 60,000 inhabitants. Viterbo is situated geographically at the center of the Province. 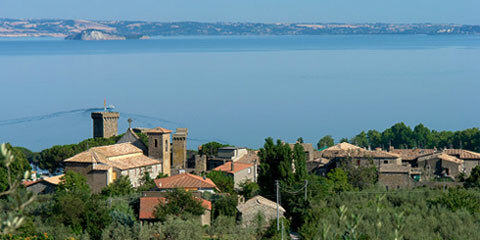 The territory of Viterbo is in an enviable position, between Umbria and Tuscany. The Province of Viterbo is an integrated land and welcoming, with open spaces and unspoiled ancient medieval villages where the pace of life is still punctuated by nature and secular traditions peasant. Everywhere in this territory, from the mountains to the sea, you can admire the wonderful testimonies of a great historical and monumental, unique and unrepeatable, with innumerable cemeteries Etruscan, Roman ruins, castles, churches and palaces that reveal the important artistic evolution and cultural living from this land over the centuries. In the towns of the Province of Viterbo life is often enlivened by festivals and country fairs,almost always linked to particular events or the usual religious rituals of the campaign. Numerous events reserved for local products and the many craft fairs where you can taste authentic culinary delights of traditional cuisine and rediscover the taste of old forgotten flavors. The climate is typically Mediterranean, dry and mild in winter, cool and airy in summer,therefore enables a pleasant stay all year. Also known as Tuscia, Viterbo expresses the vibrancy of an area where the economy was not created and sustained by man, where agriculture accounts for more than a also a great resource aspect of the local civilization, proud and generous, where the trade, secular tradition, is geared towards offering high quality, which lives in the folklore and festivals in re-enactments. The Province of Viterbo is studded with memories and appreciation of history and art, more so than in other parts of Italy. There are so many opportunities to respond to the curiosity of tourists. And 'from these values ​​in this area give rise to a tourism dimension family and at the same time I mount interesting, based on strong relationships, and friendly Available. In the province of Viterbo, as good tradition in Italy, it also focuses on gastronomy, from Because in a few hours, the dairy farms are found in many inns and restaurants the area. The Province of Viterbo, the memory of important stories and great civilizations, such as Etruscan and Roman treasure trove of priceless jewels medieval and Renaissance, perhaps concealed since too accurately the beauty of their land. Rather than proposing a comment tourist such beauty, you prefer to play on the wonder and suggestion of other stories. 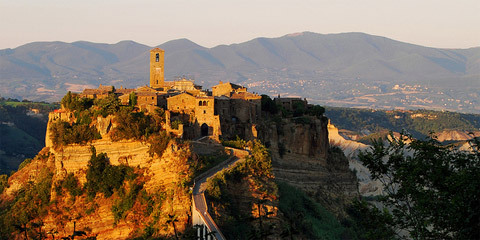 At Viterbo, central Italy's lovely, it comes to stories of "countries who die," the animated parks monsters of stone and old memories, talk about the walls, palaces, castles, villages medieval, magnificent villas of the sixteenth century. 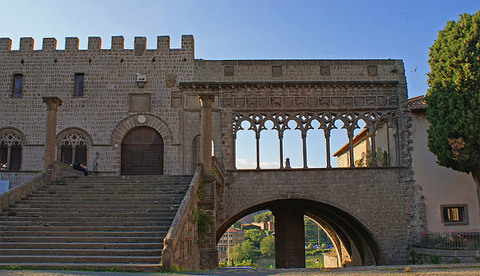 Among all the religious routes of the province of Viterbo, the best known over the centuries surely the Via Francigena. At the beginning of the first millennium Europe saw groups of pilgrims move along routes to reach the sacred holy places of Christianity, in particular Roma. Among the roads that led to Rome, of primary importance was undoubtedly the Via Francigena. In this way passed through, worn by men, cultures, languages ​​and symbols, and still are traceable in the Viterbo fragments and memories of these steps. It 's interesting to see how over the centuries to the "statio" Roman will be replaced hospitals for pilgrims and as the traveler, the soldier, the Emperor, have always left a trail or a written record of their passing or their stopover. Many countries in the Province of Viterbo, as Acquapendente, Bolsena, Montefiascone, and Ronciglione Sutri, in addition to the same town of Viterbo, owe much to this major artery (the via Francigena), which for centuries has determined urban development. In the Province of Viterbo there are large areas and archaeological evidence of a glorious past of exceptional importance. The archaeological discoveries enrich often that the local museums have difficulty setting to contain, but can be presented in a very comprehensive idea of what was one of the most advanced civilizations and mysterious Etruscan. The proximity to Rome and the ancient Via Cassia, which led to the Eternal City, has ensured that the territory is also rich in Roman remains. Will this time the theaters, the "statio", the paved, the Baths, the villages to speak. The landscape of the Tuscia that occurs in the eyes of tourists is extremely varied. Extended over an area so little like that of Rome, you can see many different natural beauty that make the area one of the most interesting in Italy. The sea coast of the Province of Viterbo shows a sandy beach close to which the typical Mediterranean vegetation grows and in some points of real sand dunes. From the sea, pushing inward, the province of Viterbo occurs initially in flat fen, hill then up to Mount Cimino, to over 1000 meters of altitude, then descend into the valley of the Tiber. The volcanic soil of the Province of Viterbo has favored in the extinct craters formation of two lakes, Lake Bolsena (first volcanic lake in Europe extension) and Lake Vico, both natural oasis of rare beauty and a destination for many tourists visit Italy. At Viterbo, Italy, emerge hot springs, whose waters are being exploited for therapeutic purposes in special spas.